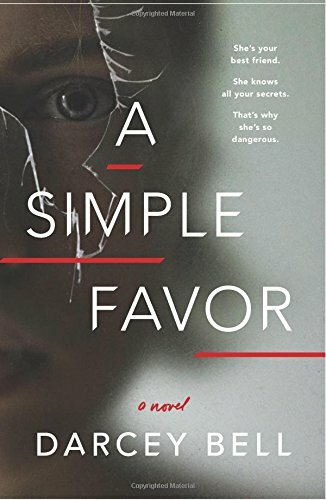 A Simple Favor the debut suspense novel by Darcey Bell released on March 21st by Harper Collins. Fox 2000 made a preemptive acquisition for feature film development within 36 hours of the book’s submission and foreign rights have already been sold in 24 countries and territories. Sharon Long is here to tell us more. We all have that best friend, whom we tell everything even things we have not shared with our spouse or our family. We think we know everything about that person as well but that may not be the case. This is true for Stephanie, a widowed stay at home mom who takes care of her son, Miles and writes mom blogs. She believes she knows everything about her friend, Emily, the perfectly dressed, always in control professional career woman. It is natural they are friends because their sons, Miles and Nicky, are best friends in kindergarten. The four spend afternoons together with the boys playing and the women drinking wine and talking. The boys have sleepovers and spend much of their time at Stephanie’s home in a rustic Connecticut town. Stephanie’s life seems fulfilled with her son, her blogs, and Emily; until A Simple Favor. She receives a text from Emily to pick Nicky up after school and Emily will pick him up by 9 p.m. The boys play and have dinner but hours later Emily has still not arrived. Stephanie puts the boys to bed and then frantically starts calling and texting Emily but no answer. The next morning still no word from Emily and Stephanie takes the boys to school trying to act normal. She returns home panicked and decides to contact Emily’s husband. Stephanie calls his office but he is out of the country for a few days. She begs for his cell phone number and calls him explaining the situation; however, Sean is not worried saying Emily is out of town for 4 days. Stephanie hangs up thinking that cannot be, why did Emily not tell her. She looks back at the text from Emily but there is no mention of being gone for a few days. She decides to take care of the boys and wait until Sean comes home. Sean returns 6 days later and comes to Stephanie’s house, but still no Emily. Now he is alarmed and calls the police. They begin their investigation and discover Emily was seen at the airport saying goodbye to Sean when he left for London and she was booked on a flight to San Francisco. But Emily never made that flight, instead she rented a car and after 200 miles on the Pennsylvania turnpike her GSP signal was lost. Sean and Stephanie do not know what to think but try to still calm for Nicky and Miles. Stephanie later learns there is a $2 Million life insurance policy on Emily which Sean took out only a couple of months before. Stephanie now starts to wonder what is really going on. Suddenly, the story takes a chilling, sinister turn. I was immediately drawn to this book which was hard to put down. The characters are amazingly realistic. We all know that perfect mom who cooks, cleans, and is always home and also know the in charge professional woman who has it all – family, home and career. Much of this story is told through Stephanie’s mom blog where the reader learns her thoughts and feelings. I loved the simple, innocent story which all at once turns eerie and thrilling. I highly recommend this novel and am looking forward to the next Darcy Bell story. As A Simple Favor points out, we all have secrets which we do not tell our friends, family or even ourselves.